Preheat the oven to 180 C/Gas 4. Grease a 900g loaf tin. In a bowl, combine the oil and sugar. Add the eggs and mix well. Combine the flour, bicarb, salt and cinnamon. Gradually add to the oil and egg mixture. 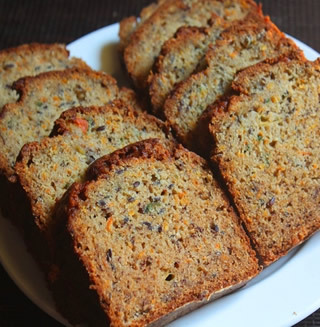 Stir in banana, carrots & nuts, if using. Pour into the loaf tin and bake for 55-65 minutes or until a skewer inserted near the centre comes out clean. Cool for 15 minutes before removing from the tin onto a wire rack to cool completely. Preheat the oven to 200 C/Gas 6. Place each potato in the bowl of wooden spoon (like you would carry an egg in an egg and spoon race) and cut across at about 3mm intervals. When they are all cut, put a baking tray/tin on the hob and add approximately 50g of butter along with 5 tablespoons of olive oil to the tray and heat until sizzling. Carefully place the potaotoes into the tray cut side down and then turn them over, spoon the fat over them. Sprinkle with salt and cook in the oven for 45 minutes – 1 hour. Test to see whether the flesh is soft. 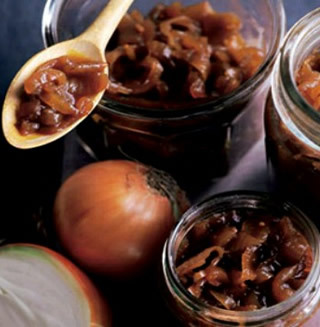 Peel and chop the onions and shallots into chutney size pieces. Put the olive oil into a pan and heat up. Add the onions, shallots, bay leaves, cinnamon stick and rosemary. Cook for 20 minutes on a low heat or until the onions are golden and sticky. Add the chilli and pepper and cook for a furher 5 minutes. Add the vinegar and sugar and simmer on a low heat until thick. Spoon into sterilised jars. The chutney can be left for 4-6 weeks to develop flavour. Lovely with cheese and biscuits! Preheat the oven to 200 C/Gas 6. 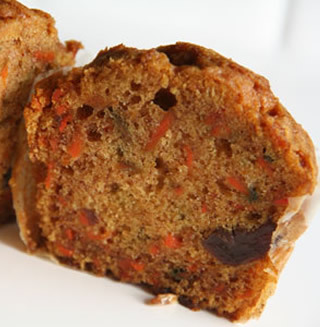 Place carrots in a mound on a rimmed baking sheet. Drizzle with olive oil and season with salt and pepper, toss to coat evenly. 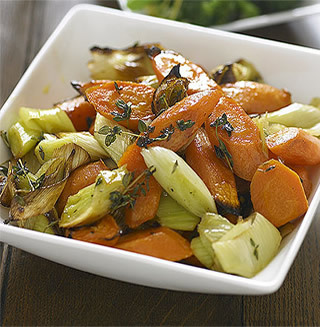 Spread out the carrots on the tray and roast in the oven for 20 minutes. Remove from the oven. In a bowl, mix the honey and apple cider vinegar together. Drizzle this mixture over the carrots and toss well. Return to the oven and roast for another 15-20* minutes. Remove from the oven, toss again and sprinkle with parsley and thyme. 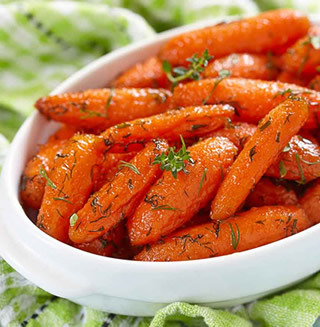 *Reduce roasting time if thinner sliced carrots are used. 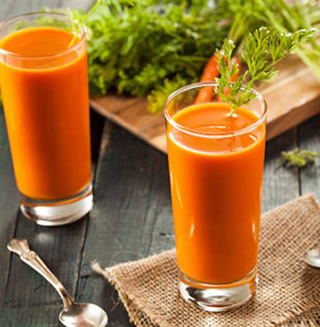 Press the raw carrots and apple through a juicer, stir in the lemon and sprinkle with a little salt. Preheat the oven to 190 C/Gas 5. Tip the cream, milk and garlic into a large saucepan and bring to a simmer. Slice the potatoes finely (about 3-4mm) and add them to the cream and milk and simmer for 3 minutes until just cooked. Gently stir to separate the potatoes and stop them sinking and catching on the bottom of the pan. 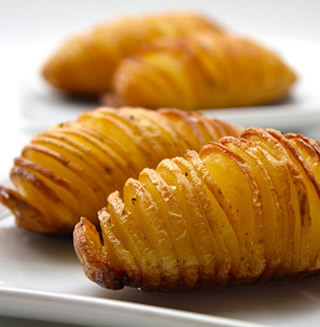 Remove the potatoes with a slotted spoon and place in a wide, shallow, ovenproof dish so that they are about 5cm in depth. Pour over the garlic infused cream (discarding the garlic) just enough to seep through the layers and leave a little moisture on the surface. 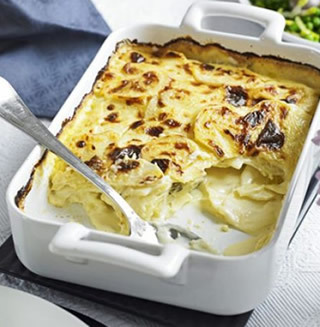 Scatter over the cheese (if using) and bake in the oven for 30 minutes or until the potatoes are soft and browned. Grate or shred the cabbage and carrots and onions. Put them in a large bowl and set aside. Mix the sugar, cayenne and flour in a bowl that will go into your double boiler. Season well with salt and pepper. Now whisk in all remaining ingredients except the mustard, in the order in which they are listed. In the meantime, heat the water in the bottom of the double boiler. Put the bowl over the heat and start whisking. Do not stop for more than a few moments while the mixture is cooking. Cooking will take 15 minutes, and you will know that the sauce is done when it’s thick enough to coat the back of a spoon. Strain into a clean bowl to eliminate any lumps, and whisk in the mustard. (Use the larger amount if you want a hotter result, the smaller if you want just a mustardy accent.) 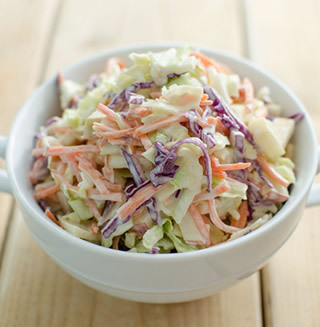 Toss the coleslaw with half the dressing, If it needs more, add it in small doses until you’ve reached the desired consistency. Preheat the oven to 200 C/Gas 6. Place 10-12 muffin cases in a muffin tray. Put the flour, baking powder, sugar, bran & mixed spice into a bowl and mix to combine. In a separate bowl, combine the eggs, melted butter and milk. Add to the flour mixture along with the carrots and raisins. Stir with a wooden spoon until everything is combined – do not over mix. Divide the mixture into the muffin cases and cook for 20-25 minutes until well risen and golden brown on top. Enjoy with a hot cup of fresh coffee! Coarsely grate the potatoes and onion into a clean tea towel and then squeeze out the excess liquid by twisting the towel. Place the mix in a large bowl. Add the egg, a good couple of pinches of salt and freshly ground black pepper. Mix the ingredients well. 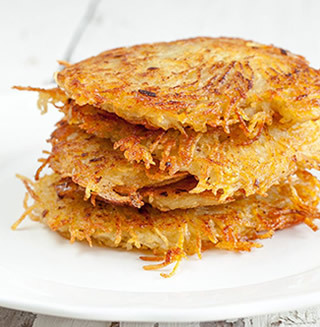 (You need to salt the mix well otherwise the hash browns can be quite bland). Heat a good glug of oil in a heavy based frying pan and when the oil is hot (but not smoking), add spoonfuls of the potato mixture into the pan and flatten into patties about 1cm thick. Flip over once browned and crispy – about 2-3 minutes each side. Serve hot as a breakfast or supper side dish. Heat the oil in a large saucepan over medium heat. Saute the carrots and onion for a few minutes until the onion has softened a little. Pour in the vegetable stock and add the coriander. Bring to the boil, and cook until the carrots are tender, about 10 minutes. Remove from heat and allow to cool slightly. 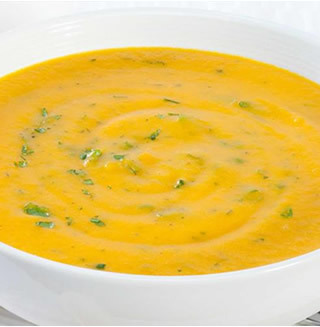 Puree the soup until smooth, using a hand blender or food processor. Reheat before serving if necessary. Serve with crusty bread. Preheat the oven to 180°C (350°F, gas mark 4). Peel the carrots and leeks. Cut into big chunks and place in a large baking tray. Cut the butter into small pieces and scatter over the vegetables. Add the dry white wine, honey and 4 sprigs fresh thyme. Season with salt and black pepper, then stir well to combine. Roast for 40 mins, stirring occasionally until the vegetables are tender and charred around the edges. Top tip: This recipe is suitable for freezing. Once cold, wrap in baking parchment and then plastic bags. Freeze for up to 3 months. Preheat the oven to 200°C (fan 180°C, 400°F or gas mark 6). In a large pan, melt the butter, sugar, syrup and treacle together, stirring until melted and smooth. 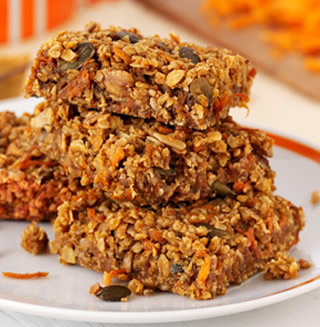 Remove from the heat and stir in the carrots, oats and seeds; stir well until thoroughly mixed. Tip into a 30x20cm (12x8in) tin and bake in the centre of the oven for 15 mins. The flapjack is done when it is lightly golden around the edges. Remove the tin from the oven. Whilst still hot make into 20 squares, then leave to cool. When cold, remove from the tin and cut into the squares. Store in an airtight container for up to 5 days.